Princess Irene of the Netherlands celebrates her birthday today, and to mark the occasion, we're looking at the diamond tiara she wore on her wedding day -- at one of the most controversial royal weddings of the twentieth century. The diamond tiara that Irene wore to marry Prince Carlos Hugo of Bourbon-Parma had been in the family for several generations, and some of the diamonds themselves dated back to the early nineteenth century. Five of the gems set in the tiara allegedly came from a diamond tiara owned by the Duchess of Angouleme, the daughter of Louis XVI and Marie Antoinette. The monarchy in France was restored and abolished several times during her lifetime, and in one of those transitional periods, she was Queen of France for approximately twenty minutes. The Duchess didn't have any children. When she died in 1851, she left the diamond tiara (and the rest of her property) to her nephew-by-marriage, Prince Henri, Count of Chambord. He also had no children, but he had several nieces and nephews, the children of his sister, Princess Louise, Duchess of Parma. 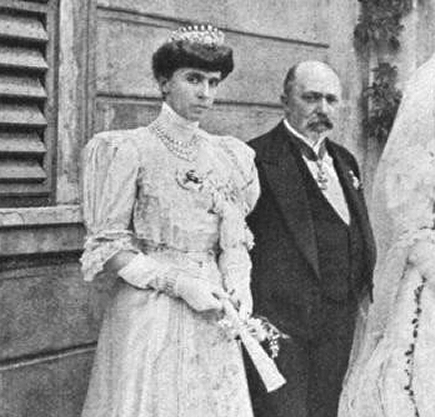 To provide wedding presents for each of them, he had the Duchess of Angouleme's diamond tiara dismantled, presenting several of the best stones to each newlywed. His nephew, Robert, married twice, and each time, Henri offered his nephew's bride five diamonds sourced from the Angouleme tiara. Robert became Duke of Parma in 1854. He had twenty-four children, twelve by each of his wives, so you can imagine how many royals today can claim him as an ancestor. (Notable descendants include Empress Zita of Austria-Hungary, Grand Duke Jean of Luxembourg, King Simeon of Bulgaria, and Queen Anne of Romania.) At some point, perhaps around the time of his second marriage in 1884, the diamonds from the Angouleme tiara were incorporated in a new diadem. 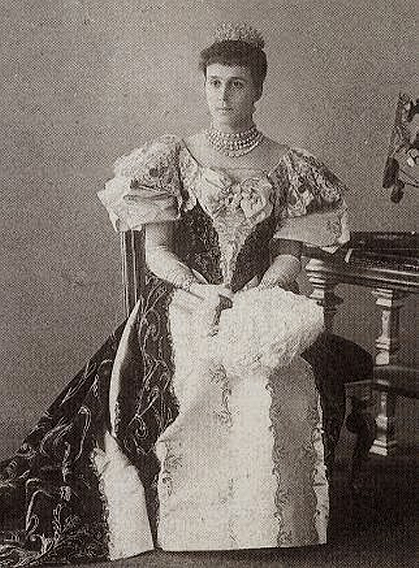 Above, you can see Robert's second wife, Infanta Maria Antonia of Portugal, wearing the new diamond tiara, which featured a distinctive row of upright diamonds. The central stone of the tiara could be swapped out and replaced with a ruby. 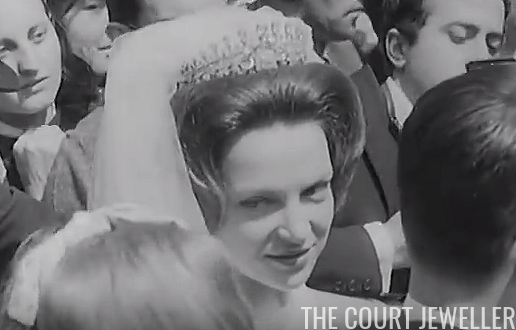 In 1964, the tiara played a visible role in a royal wedding that nearly caused a constitutional crisis. Prince Carlos Hugo, grandson of Robert, Duke of Parma, became engaged to Princess Irene, the second daughter of Queen Juliana of the Netherlands. This was a problem for an incredibly complex set of reasons. Carlos Hugo's father was the Carlist claimant to the throne of Spain, which was governed at the time by General Franco. He was also a Catholic. Irene secretly converted to Catholicism after they met, and the news was met with outrage among Protestants in the Netherlands when it became public. The government refused to sanction Irene's marriage, and her parents tried to stop her wedding. It didn't work. 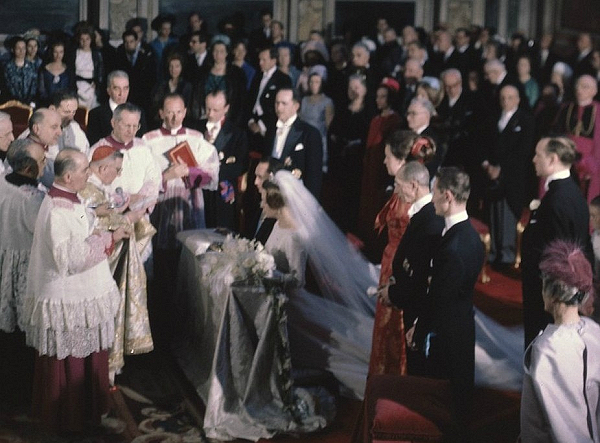 Wearing the Bourbon-Parma Tiara, Irene married Carlos Hugo in Rome in 1964, without a single member of the Dutch royal family in attendance. (Instead, they watched the ceremony on television from the Netherlands.) Irene lost her place in the Dutch line of succession, and she was compelled to live outside of her home country. As you can see in the image above, crowds gathered outside the basilica during the wedding, jostling the newlywed couple as they left following the ceremony. Irene wore the tiara throughout her marriage, which ended in divorce in 1981. The tiara stayed with the Bourbon-Parmas after Irene left the family, but it too ended up disappearing. In the mid-1990s, the tiara was entrusted to a French lawyer by Princess Cecilia Maria, one of Carlos Hugo's sisters, during inheritance negotiations. When she went to retrieve the tiara, it was apparently nowhere to be found. A French court reportedly later awarded the family a settlement of around three million pounds to compensate for the lost tiara, which has not been seen since.